Virginia Heritage's quaint atmosphere faces off against Celebrate, both in Fredericksburg, VA. 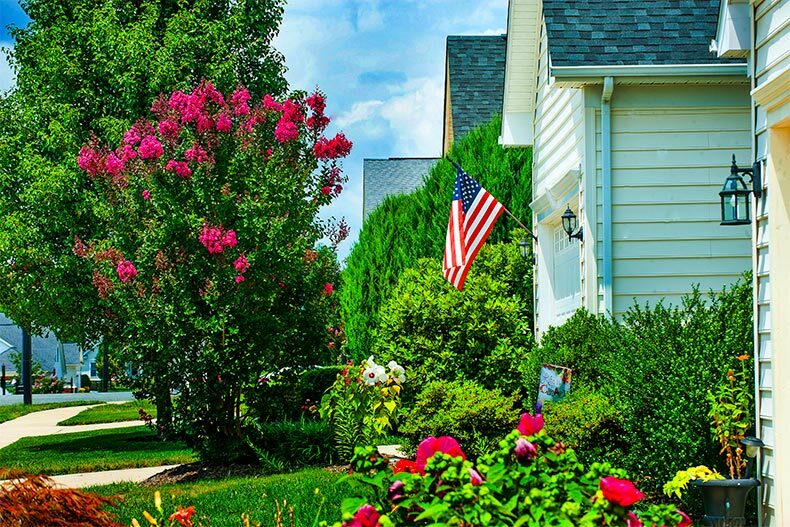 The Fredericksburg area in Northern Virginia is home to 10 active adult communities. With easy access to Interstate 95, Dulles Airport, and Washington, D.C., it’s easy to see why the region is popular. The city of Fredericksburg offers two large and popular 55+ communities: Celebrate and Virginia Heritage at Lee's Parke. Let’s discover how the two communities compare. Celebrate is one of the largest active adult communities in the whole state of Virginia with 1,100 homes. Virginia Heritage at Lee’s Parke is smaller, but still a larger community with 795 homes. While Celebrate is a gated, age-restricted community, Virginia Heritage is located within Lee’s Parke, which is a master-planned gated community open to residents of all ages. While Virginia Heritage is a separate neighborhood with its own amenities, it is still part of the larger community. Del Webb began building homes at Celebrate in 2008 and still offers new construction. Within Celebrate, prospective residents can choose from single-family and attached homes. The attached villas range in price from the high $100s to the low $200s, and range in size from two to three bedrooms and two to three bathrooms. The single-family homes range in price from the mid $200s to low $600s and are almost endlessly customizable with two to four bedrooms and luxury amenities. Both custom-built and resale homes are available. Virginia Heritage consists of single-family homes built by Lennar Homes and D.R. Horton. While Lennar offers custom-built homes, prospective residents can only buy D.R. Horton homes at resale. The homes at Virginia Heritage are similar in size to Celebrate, ranging in size from two-bedroom, two-bath homes to three-bedroom plus den and four-bath homes. The centerpiece of Celebrate is a 32,000-square-foot clubhouse called Riverside Lodge. The Lodge exemplifies resort-style living at its best. Riverside Lodge features a large indoor pool, an outdoor pool with a patio, a hobby and game room, a fitness center with an indoor walking track, and an aerobics and dance studio. Residents of the community say that the neighbors are friendly and The Lodge is a great place to meet neighbors and spend time. Outdoors, residents play tennis and bocce ball, putt on a small green, garden, or simply enjoy the natural spaces in the community. At Virginia Heritage, the clubhouse is only 16,000 square feet. While it also has a fitness center, indoor and outdoor pool, the physical amenities are on a smaller scale. The clubhouse also includes a game and card room, a woodworking shop, and billiards. Active adults can enjoy time outside on the tennis courts, bocce ball courts, or the community’s trails. Residents say they enjoy spending time at the clubhouse and with friendly neighbors. The clubhouses of both Celebrate and Virginia Heritage are the social center of the community. Both offer an on-site activities director to facilitate special events, clubs, and activities. Perhaps because it is larger, Celebrate has more than 60 clubs and groups that meet regularly. With such an array, everyone can find a group they enjoy. At Virginia Heritage, residents meet each other over coffee, during Lunch Group, at community potlucks, and at movie nights. Organized groups include book club, art club, quilting bee, history club, men’s poker, canasta, and karaoke. Although both communities are located within Fredericksburg, Celebrate is on the northern side of the city while Virginia Heritage is on the southern side. They both have easy access to the historic downtown, restaurants, and shops of Fredericksburg. Residents of Celebrate have easier access to the natural areas along the Potomac River. Celebrate is less than a ten-minute drive from chain restaurants, big box stores, and I-95. Virginia Heritage is a twenty-minute walk or less than five-minute drive to Cosner’s Corner. The shopping mall includes fast casual and dine-in restaurants, big box stores, a pet store, a craft store, and clothing retailers.